Considering that access and use of scientific evidence is essential for supporting decisions and intervention related to collective health problems, the Ministry of Public Health of the Dominican Republic, with the support of the PAHO/WHO Representation in the country, organized a two-day workshop for over 30 health managers from the technical units of the Ministry and from other institutions such as universities and hospitals. 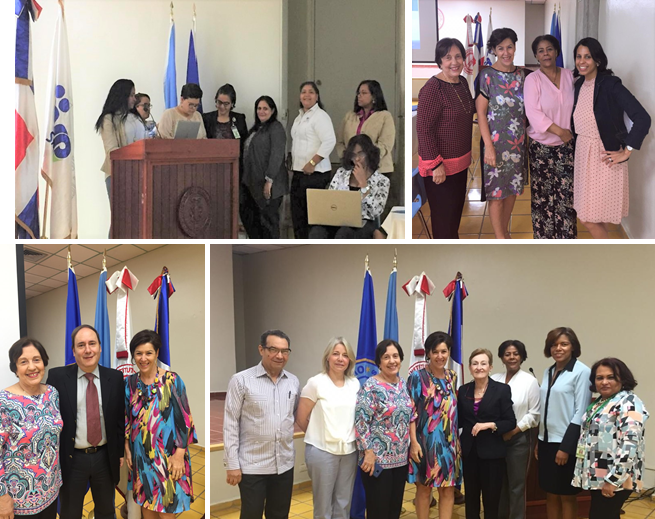 During the inauguration of the workshop, speeches were delivered by Dr. Hernán Rodríguez, PAHO/WHO Health Services (HSS) Advisor in the country, and by Dr. Emiliana Peña, Director of the Health Situation Analysis Office of the Ministry of Public Health. The workshop was facilitated by Verônica Abdala, BIREME/PAHO/WHO Manager for Services and Production of Information Sources. It was based on the SUPPORT Methodology “Policies Informed by Evidence”. Three real public health problems of the country were approached: neonatal mortality, maternal mortality and motorcycle accidents. Initially, the group searched for local evidence in order to characterize each problem. Next, possible interventions were identified based on systematic revisions. The dynamics was very interesting and everyone participated intensely. The Virtual Health Library (VHL) was one of the information sources used by the group, as well as the Cochrane Library, PubMed and HealthSystemsEvidence. In order to continue the initiative and response to the problems approached, three working groups were formed, which will be coordinated by Dr. Matilde Peguero, in charge of the Intervention Evaluation in Collective Health Department from the Situation Analysis Office of the Ministry of Public Health. The groups are to meet on a regular basis in order to develop syntheses or summaries of evidence with at least three options of intervention for each of the problems. Verônica Abdala, Hernán Rodrígues and Rosario Guzmán will continue to follow up on the working groups. One of the suggested actions is that participants take the self-learning course on “Policies Informed by Evidence”, which is available on the Public Health Virtual Campus. The possibility of creating an option of the course with tutoring exclusively for Dominican health managers, including the members of the three working groups, is also being analyzed. 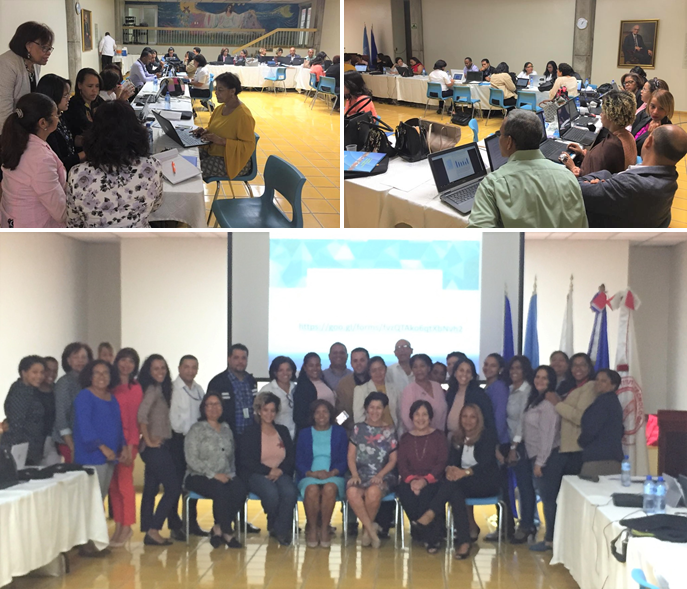 The workshop took place on March 19 and 20 of this year, in the premises of the Instituto Tecnológico de Santo Domingo (INTEC), in the city of Santo Domingo. Benefitting from BIREME’s presence in the country, on March 21st representatives from libraries and key actors from health institutions were convoked for a meeting with the main purpose of socializing BIREME’s cooperation activities and the VHL model, as well as coordinating actions for the reactivation of the national VHL. Dr. Hernán Rodríguez, HSS Advisor for the PAHO/WHO Representation in the Dominican Republic, offered the opening speech for the meeting, highlighting the importance of participating in the VHL, especially in order to update the indexation of the country’s scientific journals and other technical publications on LILACS, thus contributing to increase visibility and facilitate access to their contents. B.S. Rosario Guzmán, from the Knowledge Management field and also part of the PAHO/WHO Representation, was also present and contributed to the topic. B.S. Lucero Arboleda, INTEC Library Director and coordinator of the VHL Network Dominican Republic, also recognized the importance of reactivating the Network. According to Arboleda, this is a fitting moment, considering the accreditation process of faculties and schools in the country, and participation in collaboration networks and the presence of the journals in international indexes are important evaluation factors for accreditation. “There is a flight of Dominican production towards large journals, which has been weakening our publications,” she states. Participants manifested an interest in participating in the Network and collaborating with the proposed objectives, especially broadening visibility for the country’s scientific production in international indexes. According to an analysis made by librarian Giovanna Riggio, 50% of Dominican publications are not visible, 40% of which is from the health field. Thus, everyone was convinced of the importance of reactivating the Network and agreed to participate in work meetings in order to share experiences and advance with concrete actions that will allow reestablishing the cooperation flow among the libraries of the country. It is worthy to mention the interest manifested by the Ministry of Public Health, through the Knowledge Management Unit and the Director of the Health Situation Analysis Office, Dr. Emiliana Peña, of politically supporting the coordination of the VHL Network. Indentifying the health institutions with Libraries or Information Units and updating the VHL Network directory; mapping health information resources in the institutions; defining/attributing responsibilities among the Network; diagnosing the technical competencies for information/knowledge management and offering training for the Network as well as technical and methodological support according to the identified needs; and proposing a document of commitment to the Network, such as a Term of Adhesion or an Act of Commitment. Acknowledging the situation of the scientific health journals in the country and their presence in LILACS and other bibliographic indexes and institutional repositories is the first step. The next steps are: establishing criteria for indexation of the country’s production in LILACS and other national databases; increasing records of other types of publication (theses, non-conventional material, books); and reestablishing the collaborative flow for bibliographical control on LILACS and other national databases (if any). Approximately 20 professionals attended the meeting that took place on INTEC premises in Santo Domingo. Besides PAHO/WHO Dominican Republic, the Ministry of Public Health and the INTEC itself, the following universities were represented: Pontificia Universidad Católica Madre y Maestra; Universidad Nacional Pedro Henríquez Ureña; Universidad Autónoma de Santo Domingo; Universidad Iberoamericana; and Escuela de Medicina O&Med of the Universidad O&M.